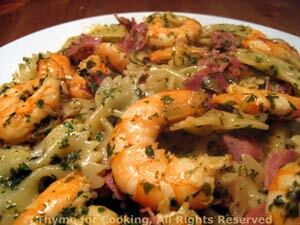 Shrimp in Garlic Butter on Pasta, Thyme for Cooking gourmet main course. This is a variation on Scampi, Shrimp in Garlic Butter. The lemon juice and white wine extend the sauce without using quite so much butter and the Prosciutto is a sweet/salty counterpoint to the shrimp, balancing the flavors nicely. Sprinkle with fresh Parmesan or not... You can use frozen, raw shrimp or pre-cooked for this. While it cooks: Clean shrimp if they need it. Mince garlic and finely chop shallots. Snip parsley if using fresh. Heat butter and oil in a nonstick skillet over medium heat. Add shallots, garlic and sauté over medium heat, stirring frequently, 5 - 7 minutes. Be careful not to let the garlic brown. Add ham and sauté 5 minutes longer, just until starting to get crisp. Add shrimp and sauté until cooked through (they'll turn opaque and curl). Add lemon juice, white wine and parsley; heat through. Add pasta and heat through, stirring. Spoon into a serving dish, sprinkle with Parmesan and serve.